The study and knowledge of Cetacea has increased in recent years with the popularity of expedition cruising with specialists aboard and the onshore presence of conservation experts working on the Tristan da Cunha Islands. So we hope to extend and enlarge this section and report on new sightings which will add to scientific knowledge in the future. 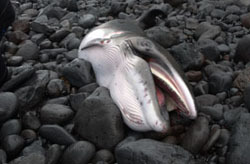 11-18m, 30-60 tonnes, a broad-bodied baleen whale without a dorsal fin, white callosities visible on the head and a short V-shaped blow. Often seen breaching, slapping its tail or 'sails' and can stand on its head with its tail out of the water for several minutes. Seen breaching from the Tristan Settlement. 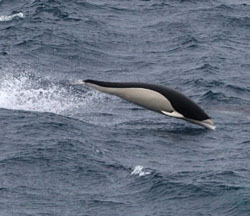 Commonly seen breeding around the Tristan Islands but numbers severely reduced by American whaling fleets in the 19th century, regarding this species as the 'right' one to catch - and hence its name. Tristan' s barter trade with whalers flourished until the 1860s - the ships calling in for fresh water, meat and vegetables. Protected since 1937, nevertheless the population was severely reduced by illegal hunting by the Russian whaling fleet 1961-2 during the Islanders' sojourn following the 1961 volcanic eruption, and now scarce. Seen during the winter months May-October off Tristan. 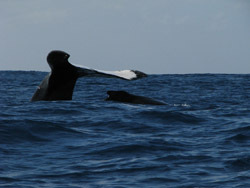 Southern Right Whales off Tristan in September 2011. 16-26m, 25-35 tonnes, a large slender baleen whale with a long head, pronounced blow-hole ridges and a tall narrow blow. Grey body with white underparts. Slender dorsal fin with a gently-sloping leading edge on far back of body. Fairly common in the open ocean over 200 miles around Tristan October - December in loose groups of 5-10, then moving to feed off Antarctic pack-ice during the southern summer. No confirmed sightings close to islands. Awaiting image - can you help? 10-18m, 25-35 tonnes, a large baleen whale with tubercles on the head, long flippers, a knobbly leading edge, a hump in front of a small dorsal fin and a ridged tail stock. Blow fairly short and bushy, larger and less V-shaped than that of the similar Right Whale. Body blackish with white flippers and varying white under the flukes. Occasionally seen in Tristan waters during migration between the breeding season (May-August) in tropical waters to summer feeding grounds off the Antarctic pack-ice. See also the story of a Humpback Whale being rescued on the Whale News Page. 8-18m, 15-55 tonnes (males significantly the larger), a square-bodied whale with teeth in the lower jaw slotting into holes in the upper jaw. Dark grey or grey-brown and easily recognised by its rounded dorsal fin, and a row of humps down its tail stock. Short bushy blow, forward and to the left. Thought to be common in Tristan waters but no recent sightings. Photo from Norman Glass of the first known stranding or sighting of an Antarctic Minke Whale in Tristan waters on 23rd November 2014: See the full story and more pictures on the Whale News Page. 6-7m, 2-3.5 tonnes, poorly recorded world-wide. Most stranded whales on Tristan of this species. Pods of 10-30 beaked whales seen regularly around the islands which may be this species, but identification difficult. Pointed snout and small, melon-shaped head, body dark grey-brown with paler stripes on flanks. Stranded whales identified by a full set of teeth (34-56) on both jaws and male has larger tooth protruding from tip of lower jaw. 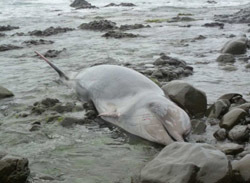 Photo from Katrine Herian of a stranded Shepherd's Beaked Whale on Hottentot Beach in January 2012 - see full story and more pictures on the Whale News Page. Kogia breviceps 2-4m, up to .5 tonne, the Pygmy Sperm whale has a small robust body and a square head with a single blowhole set slightly left of centre. It has a small under slung jaw, with 9-16 pairs of teeth in the lower jaw, and occasionally 3 pairs of teeth in the upper jaw. Just behind the eye is a false gill, and this feature (which may be an adaptation to help them 'mimic' their main predators, sharks), along with the under slung jaw often causes the pygmy sperm whale to be initially confused for a shark when sighted or stranded. Its dorsal side is grey to blue-grey, which fades to whitish or sometimes pale blue or pinkish on the belly. It has a small circular white patch in front of the eye, whilst the eye itself is circled in black. Photograph from James Glass of the Pygmy Sperm Whale stranded in Tristan's Calshot Harbour in January 2011 and identified then in Tristan waters for the first time - see also the full story on the Whale News Page. 4-7m, 2-3 tonnes, large black dolphin with a broad dorsal fin. 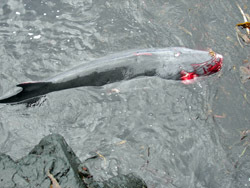 Large pods of 10-100 animals, common in Tristan waters. Have been seen but wrongly identified by inexperienced observers as Killer Whales. 5-7m, 2-5 tonnes, males larger. The largest dolphin, striking black and white with a white patch behind its eye. Male has tall triangular dorsal fin, females smaller curved fin. Pods of 2-20 animals but rare transient visitor to Tristan. 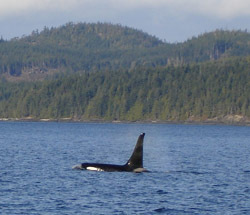 Photo from Brad Robson of a Killer Whale near Vancouver in 2006. Up to 3 metres and 116 kgs. Streamlined, slender body and the only Southern Hemisphere dolphin with no dorsal fin, which makes it easy to identify. It has a short, well-defined beak, gently sloping forehead, and small, pointed, falcate flippers. The tailstock is extremely narrow and the small flukes have concave trailing edges. The beak and lower forehead are white, along with the belly and flanks. The back is black from just in front of the blowhole all the way down to the flukes. The dorsal side of the flukes are greyish with a black trailing edge, while the ventral side is white. The flippers are white with a dark trailing edge. They have between 43 to 49 teeth in each row of both jaws. They travel in groups of up to 1000 individuals, 52 being the average group size. The mass stranding of L. peronii on beaches, as many as 77, has been recorded. Lagenorhynchus obscurus 1.5-2.4m, 150-220 kg, Small compact dolphin with a short, blunt beak. Dark grey back, flanks pale grey, underparts whitish with striking transverse stripes and a tall curved dorsal fin. Large pods of 10-200 animals, often acrobatic and following ships. Resident population of 300+ animals at Gough Island with no available records of sightings around the main Tristan Islands. 1.6 - 2m, 70-235 kg, Medium sized dolphin, with unusual colouring - dark back white underneath, while on each side is an hourglass pattern coloured light grey, yellow or gold in front and dirty grey in back. Probably quite common in Tristan waters though most records are from ships a day or so's sailing from Tristan. We hope any confirmed sightings will be reported and then details will be moved to the section above.